The 2017 GMC Canyon is a small-size pickup with performance specs to rival those of larger trucks. Offering a selection of driver control features and three engine options, including a segment-first 4-cylinder, the GMC Canyon makes a statement with its sheer muscle and collected attitude. 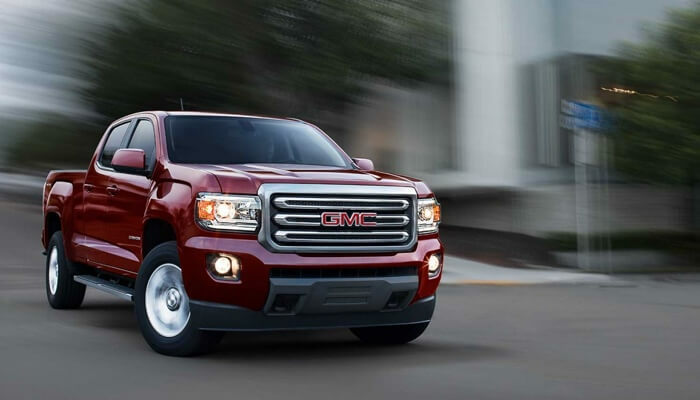 Read on for a closer look at the GMC Canyon’s engine specs, towing capacities, and next-level handling technologies! 2.5L I4 Engine: Paired with a 6-speed manual transmission, the standard 2.5L I4 engine produces 200 hp and 191 lb-ft of torque, making it the most powerful in the segment. What’s more, this energetic 4-cylinder tows up to 1,588 kilograms with ease. 2.8L Duramax Turbo-Diesel I-4 Engine: The optional 2.8L Duramax Turbo-Diesel I-4 engine is B20 Biodiesel capable and comes with a 6-speed automatic transmission. Altogether, the turbo-diesel engine generates 181 hp and a whopping 369 lb-ft of torque, and reaches a peak trailering capacity of 3,493 kilograms. 3.6L V6 Engine: New for 2017, the optional 3.6L V6 engine with Active Fuel Management creates 308 hp and 275 lb-ft of torque, and operates alongside an 8-speed automatic transmission. With the available Trailering Package, the V6 engine tows a max of 3,175 kilograms. StabiliTrak with Traction Control: This system notices when your vehicle isn’t responding to your inputs, and intervenes to encourage greater stability and traction control on wet or icy roads. Available Tow/Haul Mode: Standard with the V6 and Duramax engines, Tow/Haul Mode modifies the automatic transmissions’ shift patterns for a smoother ride over steep grades and during heavy-duty trailering. Available Four-Wheel Drive: The Autotrac four-wheel drive system includes a 2-speed transfer case, and intelligently alternates between rear- and four-wheel drive, depending on road conditions. Available Automatic Locking Rear Differential: Standard on SLT and Denali, the differential locks and rotates the rear wheels simultaneously if different wheel speeds are detected, resulting in a significant traction boost. Choose Your GMC Canyon at Westridge Buick GMC! Experience the 2017 GMC Canyon’s thrilling performance capabilities for yourself at Westridge Buick GMC in Lloydminster! If you’d like to book a test drive, contact us during regular business hours: 9 a.m. to 6 p.m. Monday through Saturday. You can also visit our dealership at 2406 50th Ave in Lloydminster; we’re located right on the border between Alberta and Saskatchewan!